There have been tablets before the iPad. They weren't as beautiful or well crafted, but that wasn't why we chose not to pick them up. It was the software. To call the iPad a big iPhone is both truth and disservice, belying the simple fact that changing the screen size really does change everything. It's more than the difference between standard def and HD, between 5 1/4-inch action figures and 10-inch scale, between vegan facon and real pork belly. When you open Scrabble for the first time, and the entire board's splayed in front of you, or holding the screen aloft, steering your plane in Plane X so it doesn't crash into the ground, it physically soaks up enough of your viewing field you can actually become absorbed. Like Jesus says in his breakdown of the hardware, "The iPad functional objective was to make the product as invisible as possible, a simple, elegant stage for the real important actors: The applications." 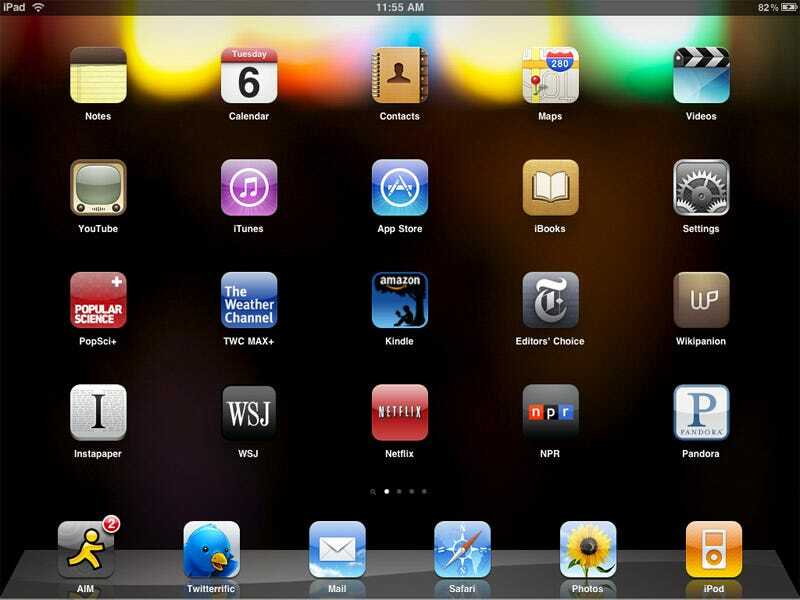 The iPad software is familiar, though, because Apple trained the world how to use it with the iPhone. A grid of glossy icons—touch one, and the app balloons out of nowhere to fill the screen, remaking the iPad into something completely different than it was a second ago. The gestural language of multitouch—the pinches, the swipes, and the flicks. It's an interface designed to be manipulated entirely with your fingers, and the basic elements of all translate, just on a slightly grander scale. It's simple, slick, natural. Speed. Speed matters. When the hardware disappears, and there's just software in front of you, speed is what makes the verisimilitude of directly manipulating whatever's the on the screen bleed into the sublime. It's the responsiveness that makes you feel like you're actually zipping around a map, not swiping at a screen that's merely interpreting electrical signals generated by your fingers into commands. The second "wow" moment—after you turn the iPad on and the screen bursts to life—is when you flick through a entire web page with a single swipe, instantly and smoothly. One of the ways it's fundamentally different from the iPhone is that the interface and software are now truly designed to be used equally in both portrait mode and landscape. It sounds like a small thing, but it's not—it gives power to the idea that you can use it however you want, that it's really a blank slate that morphs to become whatever you want it to be. It's remarkably proficient at figuring out exactly how you're holding it, and the software gracefully, speedily adjusts itself accordingly, rolling into position. All of the core applications—Safari, Mail, iPod, Notes—shift into new layouts, optimized for whichever way you're holding it. It feels so natural so quickly that you simply expect it to be the case, so when third-party applications don't remold themselves to how you're holding the iPad, it's jarring. Even if the iPad perfectly upscaled the iPhone interface and apps, pixel for pixel, they wouldn't feel right on the iPad, so (most) everything is redesigned for the larger screen, when it makes sense. For instance, slide-to-unlock is the same distance as it is on the iPhone, but the iPod music lockscreen controls that you can see above are spread across the entire screen. Two new user interface conventions in particular transform apps to make real use of the extra space with either more information density or greater focus: Split view and popovers. (Twitterific isn't a native app, but it shows off both here.) Split view appears in landscape orientation, and presents two windows panes—typically, on the left is navigation (your various inboxes in Mail, music sources in iPod, all of your notes in Notes) and on the right is whatever you've selected (a message, an album, a note). On the iPhone, this would be two distinct screens—you click on something in one pane, and suddenly you get the other pane—drilling down instead of working in parallel. Many apps, particularly ones that are using mail as a UI model, like Instapaper, use this. Popovers, a kind of contextual pop-up dialog box layered on top of whatever you're looking at, are in almost every app. Completely contextual, they can act as navigation panes (like when Mail's in portrait mode, a popover shows all of your messages or inboxes); or typing a URL in Safari, a popover will appear, showing suggested URLS based on your history; or a scrolling list; or as a navigator to pick out a photo to load into iWork. It's a second layer, one that never existed on the iPhone because there isn't enough space. The iPhone evangelized the rather retro notion of running just one app at a time. And this has been mostly fine (though by no means excellent), given the screen size, and with workarounds like push notifications. The limits of these workarounds are more painfully exposed by the iPad's giant screen: Switching out of a game or movie or email to dedicate the entire display to instant messaging feels absurd and wasteful, even considering that, in landscape mode, half the screen is dedicated to the keyboard. What's sad is that the kinds of things people commonly want multitasking for—mostly people who don't even care what true "multitasking" means—seem simple enough, even for this operating system: Messaging, geolocation and playing music from apps like Pandora in the background. Even though Pandora makes beautiful use of all the room it's granted, not being able run it in the background while surfing the web, typing out an email—or hey, sending an IM—just feels ridiculous in so many ways. Every time you have to close it to do something else, a little bubble of fury rises in your throat, erupting as a flustered sigh. I really can't respond to my friend's message without closing everything I'm doing on this huge thing? The choices you're being forced to make feel false and arbitrary, like bacon or eggs. The hardware constraints that made running one app at a time make sense are nearly obliterated in the iPad—the battery and screen are an order of magnitude larger, the processor markedly zippier. I suspect the remaining hardware cramp may now be the paltry amount of RAM in the iPad, a mere 256MB—the same amount that's in the iPhone 3GS—but it doesn't really matter why. As Apple's fond of intoning, people just want it to do what they want it to do. For a blank slate that can magically transform into anything, Apple's preoccupation with mimesis might seem a little curious. The Contacts app looks like a Moleskine address book while Calendar imitates a real-world datebook—though it functions so beautifully and smoothly it's very possibly my favorite native app. iBooks uses a bookshelf metaphor that practically smells of rich mahogany, and books whose pages turn with a realistic animation that you can't turn off. Ticking off messages in Mail stacks them like a pile of paper. In other words, Apple wants their apps to feel something like real-world experiences. As Jesus noted, "Apple designed this device to be treated like a book," and this carries through to any app that's an abstraction of paper. Maybe it's meant for your parents to feel more comfortable using the iPad to read books and organize their contacts and calendars, but the implementation of the realism feels so cheesy in some places that it's simply not comforting, not even to that target audience, I suspect. Yes, it's pretty much a jumbo iPhone keyboard. (An idea that seemed so silly, we made fun of it.) We have been typing on the iPad in depth here, but simply put, an external keyboard is ideal. Still, as we noted earlier, the compromise here "is going to be inherent to all touchscreen keyboards on tablets." There's no novel solution, not for Apple or anyone else. The native iPad apps have shrunk in number versus the iPhone, and—with the exception of Safari, Mail and the App Store—the remaining apps carry much less weight. Which is to say, you won't use them as much as you do on an iPhone. The iPad is really all about the applications and content that developers will create. Quite honestly, the App Store on the iPad is now the best way to get apps. Navigating and finding apps feels far more serendipitous and engaging than pointing and clicking on a desktop, and with the screen real estate, you can actually see the store and app previews, unlike the iPhone. It manages to fracture one of biggest advantages, though, by jerking you out of the App Store every time you buy an app. This should feel seamless, and allow for more of a shopping spree. If the transactions happened almost invisibly, it wouldn't feel like you're spending money as apps pop onto your iPad, and you wouldn't feel like you've got whiplash, either. Also, the most fundamental problem with the App Store remains: The interface breaks down when you're trying to sort through a sea of 150,000 apps to discover a few you'd really want. And the iPad's sole surviving instance of Cover Flow, a floating widget of app previews at the top of the home screen? Kinda gross lookin'. The velocity of scrolling, zooming and panning around web pages in Safari is one of the first "whoa" moments you'll have with the iPad. It's superfast, which is why it feels so awesome. The size is the other component—being able to see that much of a website radically alters the experience, turning it into something that's incredibly satisfying. Really, you've never felt anything like it. Safari's one place where the iPad's memory shortage makes itself apparent, since you're limited to nine windows, and quite often, it dumps the contents of a window, so when you go back you'll have to reload the whole page. That's pretty annoying. This is also, I suspect, why it doesn't have true tabs: People aren't encouraged to open a bunch, because it can't handle it. Still, tabs would be incredibly welcome for the sheer fact that the iPhone-originated process of switching between windows (click the button, you're taken to a thumbnail view of your windows, then click the window) feels more tedious than ever. With this nice big display, it shouldn't take two screens and multiple seconds to switch to a new window when everything else practically flies. Something else we'd like? Text enlargement, like in desktop Safari. Our own Jesus, like many old dudes, prefers larger text. There's no reason it can't be done now. And when we're scanning whole, giant web pages, there's really still no "find in page" search feature? The traditional photo album grid has never felt slicker. Zooming in really fast, incredibly smoothly, on huge photos is definitely one of those "oooo" moments, as is "pinch to peek." The problem? Getting your photos on there and syncing is still pretty messy, pulling them in albums via iPhoto or in specific shots via iTunes. Legitimate connections to online photo services would be nice too, so you could populate it with your Flickr or Picasa or Facebook photos. Hopefully these services will soon roll out apps to handle this from their end. Given that it looks so much like its iPhone forebear, perhaps more than any other iPad app, you'd be forgiven for not realizing it's one of the most important apps on the iPad. In truth, it makes use of every new bit of user interface, and it's the starting ground for so many other apps, from RSS readers to Instapaper to Twitter clients. In landscape, it uses the split view, with your inboxes or messages on the left, and the contents you've selected on the right. The panes look and feel like their respective iPhone screens, just fused all together. If you hit "new message" or "reply," an overlay pops up with the keyboard, which takes up half the screen, and a message box that doesn't quite cover the entire top half of the screen. (You'll see this messaging overlay pop up again and again in apps like Twitterific.) Adding contacts takes place via a scrollable popover—like the old contacts list, but it doesn't take up your entire screen. Portrait mode is more focused: When you select a message, it's all you see. To switch to a new email or look elsewhere in your accounts, you have to bring up a popover, which runs down the entire length of the iPad shows you the rest of your inbox. The mode overall is good if you have a hard time concentrating, but navigating via the popover can feel a little disjointed. Contacts is one of the literal "I'm a book!" apps that takes it a little far for no apparent reason. But cheesy art effects aside, in structure it's like iPhone contacts but with a two-pane view, like the Mac Contacts app. Notes is essentially the same as the iPhone with more "realism" added via the subtle outline of stitched leather surrounding the yellow legal pad. It's still gross. Calendar, on the other hand, is a graceful application that makes the iPhone Calendar feel too constrained, and the desktop iCal feel too convoluted. Sort by day, week, month or list (showing the next 10-15 events). In day or list view, the list of events is in the left pane, and a closeup of individual events or days is in the right pane. Week and month views zoom out to a traditional calendar view, where popovers reveal event details. A scrubber on the bottom lets you quickly zip to any day or week, depending on the view. It's really nice, at least for basic calendar usage. It's iPhone Maps, but bigger and so, so much faster, and that's a world of difference when you're talking about zooming around the world. It's hard to believe this is YouTube, almost—it looks too polished. The streamlined interface is miles ahead of what you get when you type youtube.com on your desktop. I can actually just sit and watch YouTube for the first time ever, also thanks to the surprisingly great video quality. iPod seems a little out of place, I have to say. It doesn't quite look like anything else, though that's not necessarily a bad thing. It's the jukebox essence of desktop iTunes, stripped to the silver bone because it only does one thing: Play music. Considering what iTunes is like on the desktop, that's kind of refreshing. Apps that essentially mono-task are fine, and they definitely expose how goddamn unwieldy the desktop iTunes as grown (as well as the fact that Apple is aware of this), but there are definitely missing features we'd like to see. If the iPad is designed to be used in your house, why can't you music and videos from your desktop to your iPad using iTunes, right inside these apps? Seriously. And why isn't iTunes Remote iPhone app updated for iPad, to be used to control your desktop's iTunes? Little things like that would add up to make the iPad feel that much more connected. And how about the entire setup process, which slavishly ties it to another computer with iTunes. It can't replace your parents' complicated desktop, because you need that complicated desktop to setup the iPad, and then to manage your music and videos (not to mention software updates down the line), so it's frozen as a secondary device. Then are the moments you wish it was more connected, like a phone. Take the Nexus One. Two minutes out of the box, a minute after punching in my email address, all of my contacts and emails are there. I didn't plug it into anything. In other words, it's the moments where the iPad feels like it could be more, and you know it in your hands, in your fingers, as you're holding it. That it has this potential to do this or that, but it doesn't yet, and you really really want it to, because you're so incredibly enthralled with everything it already does. Potential. Promise. Hope. That, if anything, is the real magic of it. In the meantime, it's off to a pretty good start.